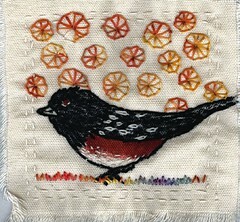 Yet another quiltlet. This one is stamped with a hand carved stamp and the shapes are from my 'new series' based on the Molinillo. 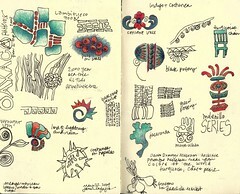 I have a collection of them from my trip to Oaxaca. 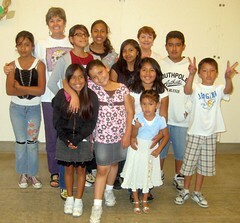 Here's a pic of the last Mundo Lindo class (the thursday kids). We made kites and flew them in the park. It was lovely. I hugged each child at the end of class, and told them a few things that made him or her a great kid. 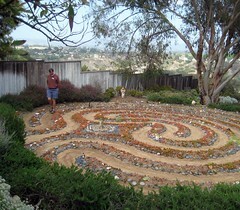 The VERY good new is that a large non-profit in Escondido wants to hire me to continue Mundo Lindo, and we met yesterday. I'll keep you posted, but hopefully it will start up again in the fall, this time just once a week, but still free to the kids. I feel good about this--very good. Thanks for your support too! 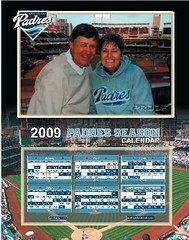 Oh look, the San Diego Padres made Husb and I their calendar couple! ha ha. Actually, we went to the game thursday night (had a great time) and the photographer snapped this pic and put it here, so we could order $$$$ worth. As you know, the after-school art program I created is coming to an end after 2 amazing years. Grab a cup of coffee, or depending on the hour, a glass of wine, and if you like kids and kid's creativity, watch this photoset in a slide show. It really tells the whole story of Mundo Lindo ~ beautiful world. 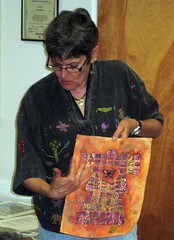 I demoed last night at the Ramona Art Guild. They are a lovely group, very friendly and fun. (Don't look at this picture of me. It was warm, so my bangs are curled up, goofy facial expression, and I'm wearing my husband's watch, because mine is being repaired.) 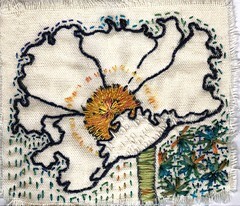 Do look at my recently completed artwork. It's called 'Butterfly Aloe Kimono.' It's was created, in what I'm calling mosaic collage. I've worked with the kimono shape for a long time, and have recently returned to it. More to come! Travel to Ovieto, Italy as a “journey of discovery.” You will experience Italy authentically and thoroughly. Learn about Italian food, wine and culture and enjoy learning to sketch and watercolor the things you see. You’ll will savor, experience, and delight in all Italy’s richness. May 23 Arrive Orvieto, welcome dinner; May 24 Orientation, guide to your week, living in the moment.Learn to sketch what you see. Spend the morning drawing and painting some of the details of our B&B, its plants and architectural details. 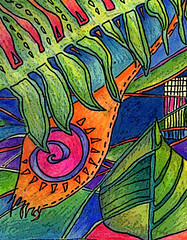 Colors of Orvieto walking tour, Italian culture, wine tasting; May 25 Sketching and painting in the town of Orvieto. Cooking class, learning the art of making pasta, dinner & wine; May 26 Sketching and painting on location at the Etruscan Necropolis and the Cathedral San Brizio Chapel. 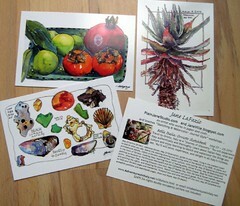 Shop for local treats and picnic, afternoon free, evening Etruscan cave tour; May 27 Market Day. Visit the food & flower market, sketching and painting the sights, and shopping for picnic. 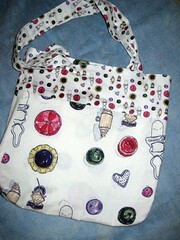 Sketch and paint our picnic goods. Picnic! Create portfolio to hold your Orvieto pages and mementos. Vineyard tour and wine tasting off the rock; May 28 Complete and embellish portfolio and sketchbook pages, show and share; May 29 depart. We saw Judy Chicago speak last night at San Diego Museum of Art. Her seminal work "The Dinner Party" made a great impression on me, and I have great admiration for Judy's drive, talent and collaborative projects. Last night, when asked the difference between art and craft, she said "craft is used for it's own sake" and "art is used in the service of meaning." 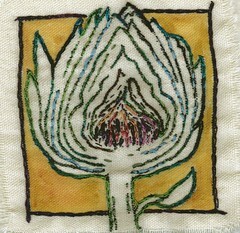 Judy's work is foremost about meaning and message. 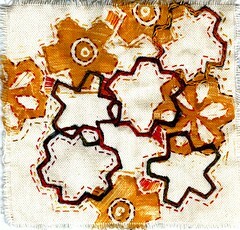 She selects the materials after, or based on the meaning she wants to communicate. 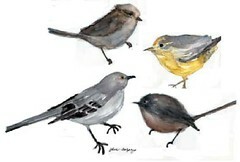 When I think of my artwork, I can name only one or two pieces that began as 'meaning' first. Usually I start with the materials, and sometimes, find meaning from them, sometimes not. Not my best work, but I'll post it anyway. Add this to the list of why I love my husb. He walked the Labryinth. 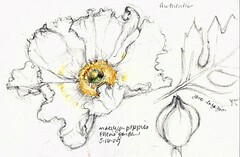 Matilija poppies in pencil with a touch of color pencil. From the workshop I took on Saturday. Wendee posted a link to this cake recipe on facebook and I just had to try it. I couldn't find gel food coloring, so I just used regular. put the batter in the pan, per the directions. It turned out pretty good! 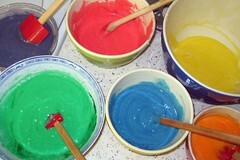 though looking again at the recipe, I see I was spose to put all the colors in each layer. Oh well--Next time! I made this for a dinner party last night. Happy belated birthday Jeannie and Susie! Button box is quite cute in the smaller version. 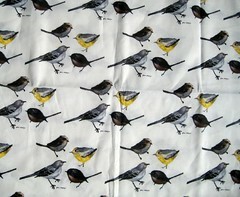 I scanned four pages from my moleskine watercolor journal and layed them out for the Bird Parade fabric. 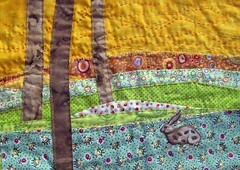 This is the 18th quiltlet...and I just keep makin' them. 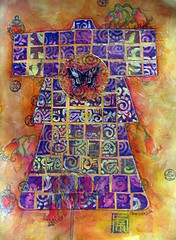 I used Judy Coates Perez' DVD techniques to make this painted quilt. 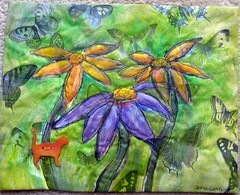 And then I had to add the shrinky dink cat I made with the Mundo Lindo kids. I watched my friend Melanie Testa's new DVD, and have begun reading her new book Inspired to Quilt: Creative Experiments in Art Quilt Imagery and was immediately inspired to try something. Unlike Melly, however, I didn't make a 'map' and just worked intuitively. 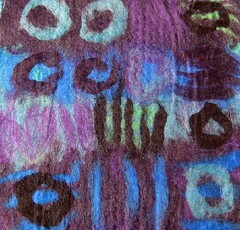 And, I didn't use dyes, I used Shiva Paintstiks...but I did use hand-dyed silk organza, cotton fabric and freezer paper. 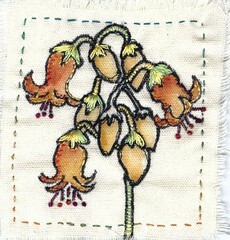 Three layers about 5x9" hand sewn. 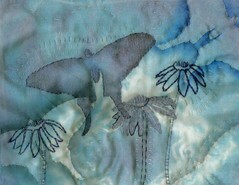 Oh yea, and Melanie Testa is coming to San Diego to do a two day workshop. 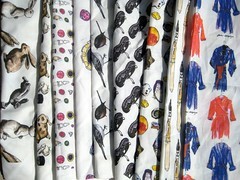 Monotypes combine the spontaneity of printed dyes and cloth, creating a surface that is unlike any other technique. 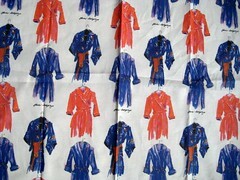 Each image can only be reproduced once, making your fabric unique and original to you. Combined with the use of Soy Wax, we will explore ideas of scale, motif, texture and depth. 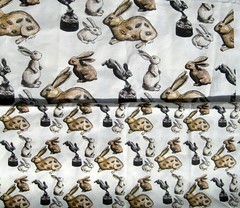 We will be using Procion MX dyes on cotton fabric in this two day class. 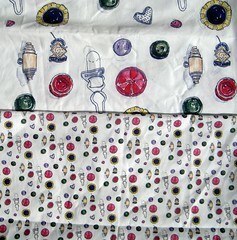 Materials include 2 yards prepared fabric for dying, fiber reactive dyes and soy wax and tools. 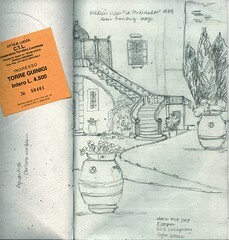 This is a page from my 1998 journal from an artist-led trip my husb and I took to Tuscany. The trip was truly a life changing experience and I was in Italy when I accepted that I was an artist and that I had a gift. Looking back on my journal, I'm instantly transported back to the experience:the sites, the food, the architecture, even the smells and voices. I'm thrilled to be going back to Italy a dozen years later in May 2010. I really hope you can join me! 10 Reasons go sign up for my “Bella Italia: Orvieto Sketchbook” May 23-29, 2010. Dreaming of travel in Italy? Come with us as we share the treasures of this beautiful country through our Adventures in Italy - journeys of discovery. In this small group tour, we eat, breathe, touch, and feel the REAL Italy through authentic experiences designed to embrace you with the magnificent Italian culture. 1. 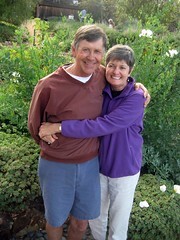 Our hosts: Kristi and Bill Steiner, have vast knowledge an experience in Italy and Orvieto. They’ve been traveling to Italy for 17 years and to Orvieto for 7. Through the years, they’ve built friendships and relationships that allow them to share experiences with us that most travelers never get. 2. A journey of discovery: You’ll spend a week in beautiful Orvieto in what is called slow travel. By staying in one place, you sink into the daily rhythm of Italy, discovering the passion of Italian living. Linger over a morning's cappuccino, wander through tiny ancient alleyways, and savor long delicious meals created from the freshest local ingredients. Discover insights into artful living and within yourself. 3. 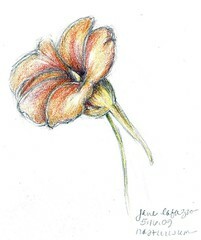 A learning vacation: Learn a new skill of drawing and watercolor or deepen your existing skills one as you share the week with me and other like-minded folks. Use the colors and textures, the history and architecture of Italy to inspire your creativity as you capture priceless memories of your week on your journal pages. I will gently guide beginners as well as the more experienced to draw what you see, to capture the small details of a place, while savoring sounds, smells, and breezes around you. 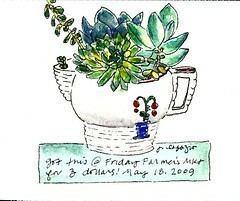 We’ll slow down, sit quietly and really ‘be’ in a place, while we sketch and watercolor and journal artfully. The skills you learn here will be with you always. 4. A most fabulous cooking class: Make pasta from scratch with a world renowned chef as he shows you his trade secrets. Then sit with your new friends as your pasta dish and many others are served, accompanied by local wines. 5. Explore a vineyard and taste local wines: Spend an afternoon at the exquisite Palazzone where Giovanni shares his passion for creating excellent wines. The site is beautiful, with views back to Orvieto. The original house dates to 1300 and is now a locanda (B&B.) Giovanni will introduce you to several of his wines and help you understand what it means to make wine in Italy. He loves answering your questions. You will not forget this day! 6. The nuances of olive oil: Begin with a fascinating look at olive oil as you sample local selections in an afternoon of olive oil tasting. An official olive oil taster will show you how a true tasting is done. 7. Shop with the locals on Market Day: The weekly market is essential to life in Orvieto. Join locals as you shop for produce picked hours before, just a few kilometers away. Here you have the chance to see Italians up close as they warmly greet each other, boisterously argue with vendors, and lovingly select seasonal flowers to adorn a table at home. 8. Retreat and renew in your restful convent B&B: San Lodovico, the convent B&B, where you stay provides, in many ways, the anchor for your visit. It is a retreat, a quiet, peaceful place, a calm presence as you go about your week. There are places to look out over the countryside, places to sit and think places to enjoy the sun’s warmth, a garden to wander through, grand spaces to marvel at, and flowers to enjoy. Including guidance on plane tickets, itineraries and travel beyond your week in Orvieto. Once in Italy, they ensure you have everything you need for a comfortable stay. They are your hosts, accompanying you on all cultural events and guiding you around town. I'm having fun with these doodle quilts...It's easy to do one per day, by drawing and painting it quickly, then stitching it in the evening. 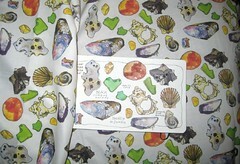 MORE Spoonflower fabric! I think this is the most succesful so far. By the way, that's my Moleskine sketchbook in the center, with the original watercolor page. 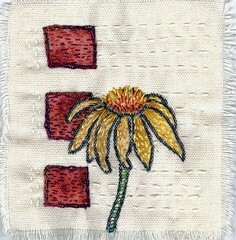 Another quiltlet, based on a page from my sketchbook.